At Dogberry Collections, we're all about form and function. Our ever-growing selection of mantels and shelving is no exception to that - with plenty of options to add style to your storage. And as usual, available in a variety of finish options and sizes. This design gives you the best of both worlds . . . 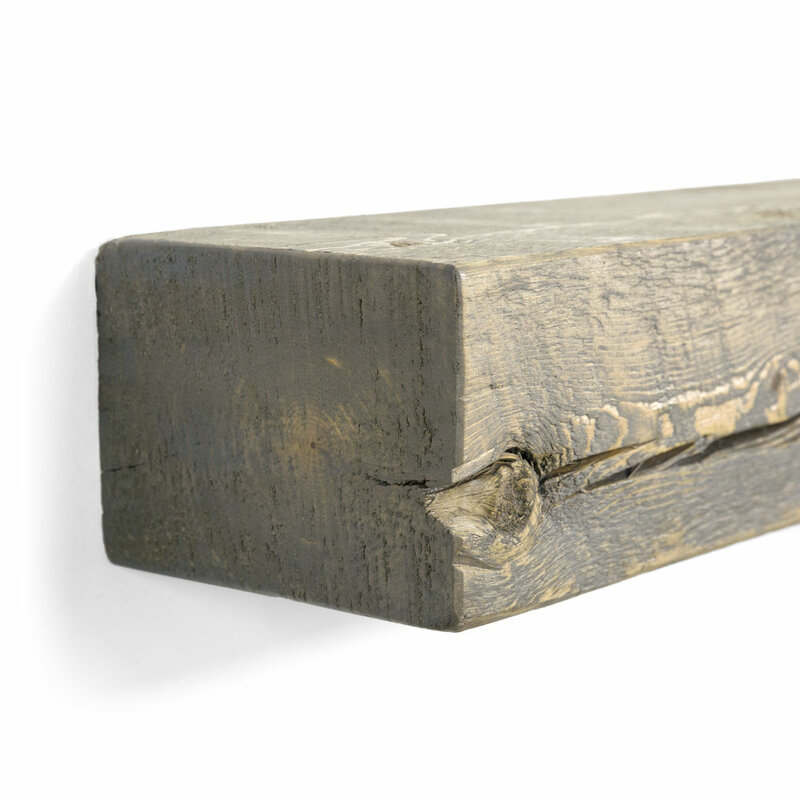 Distressed planks of real Knotty Alder give the appearance of a hand-hewn beam, but the hollow-body construction allows for simple installation. Use as a floating shelf or a fireplace mantel. Pictured below in our Aged Oak stain. This item is exactly what the name says: a mantel cut from a solid piece of rough-sawn Pine timber, plain and simple. If you're looking for the real deal, look no further. And don't worry about installation - we include easy-to-follow instructions, all necessary hardware, and even complimentary drill bits. Choose from our unique finish options shown below. Constructed from real Alder planks, this simple yet elegant piece fits perfectly in a modern or country chic setting. The hollow-body design allows for simple installation and application as a floating shelf or a fireplace mantel. Pictured at left in our Aged Oak stain. 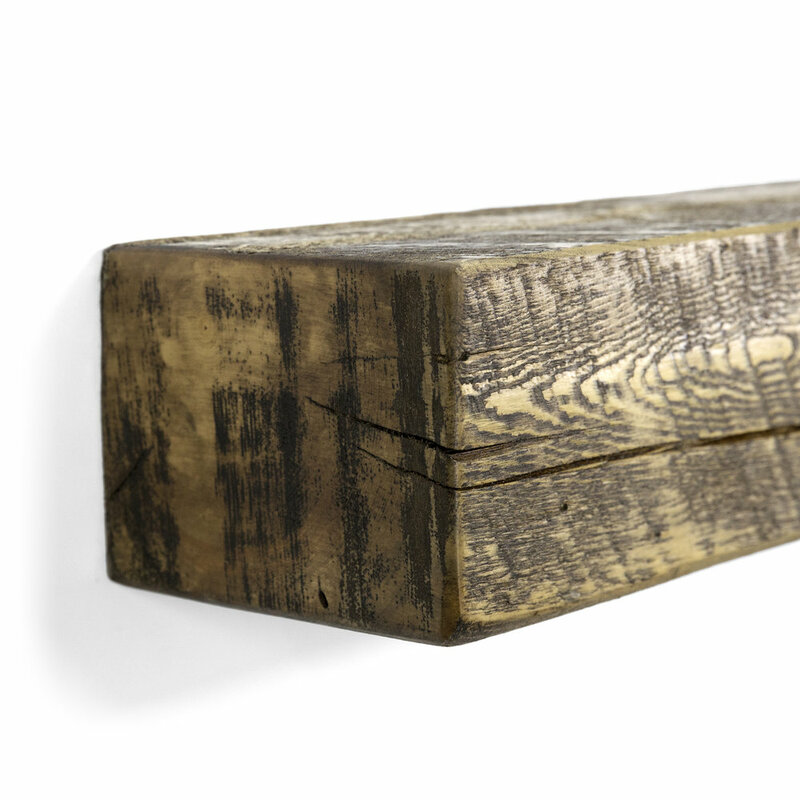 Constructed from planks of Knotty Alder wood, the distinct adze texture will give depth to your home's style whether used as a fireplace mantel or a floating shelf. Just like the Farmhouse and Rustic, this hollow-body mantel is simple to install. Pictured at right in our Dark Chocolate stain. With a hollow-body construction from real Alder wood planks, the ridges carved in the face and sides will add interest to any setting. Easy to install and built to last. Pictured at left in our Midnight Black stain. These floating shelves are similar to items in our mantel collection, but with slimmer profiles. The Farmhouse Floating Shelf (pictured at right), features a hollow-body construction from Alder planks. The Solid Timber Floating Shelf (pictured at left) is made from a single piece of Pine. Both styles of shelving include the necessary hardware for installation.